(Broomfield, CO, February 18, 2014) – PhoneSuite, a leading provider of hotel voice communication solutions for over 25 years, today introduced the Series2 V.IP, a powerful VoIP-based telephone system designed specifically for hotel use. As a follow-up to PhoneSuite’s ground-breaking Voiceware IP-PBX software solution, the Series2 platform allows hotels to utilize the features and functionality behind Voiceware with existing analog phones, wiring, trunks and infrastructure. It is based on open standards to protect your investment and facilitate new features and functionality, and can operate with the latest SIP or standard guestroom phones. 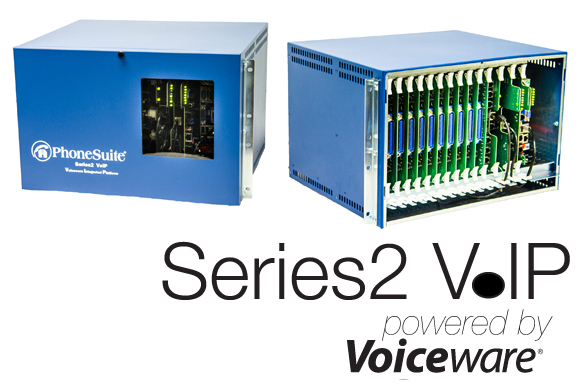 Using Voiceware to drive the Series2 makes the total solution flexible and scalable. It fits the needs of any size property, and makes the front-desk staff more productive, while providing a better experience for guests. Series2’s VoIP server and analog ports are enclosed in a single cabinet that supports 240 guestroom phones, and can be combined with additional cabinets to support an unlimited number of rooms and phones. Other benefits include: one power supply that drives all the ports and significantly reduces electricity bills, and a failover operation, which, in the event of a VoIP server or LAN failure, kicks into failsafe mode and operates as a stand-alone phone system. “Our new Series2 V.IP system truly offers the best of both worlds by combining a traditional telephony platform with VoIP technology. It’s feature-rich with modern, easy-to-use administrative functionality that will take your hotel communications to the next level. PhoneSuite is proud to continue being a go-to voice solution provider for any size or type of hotel, chain or management company,” said PhoneSuite President Frank Melville. consumption systems are two to four times more efficient than the competitors’ products, which lowers electric bills by hundreds of dollars. And PhoneSuite remains dedicated to the hospitality industry by offering U.S.-made, energy-efficient products that are approved and installed at numerous national hotel chains. For over 25 years, PhoneSuite has leveraged its expertise in communication technology to provide high-quality, low-power consuming products. PhoneSuite is dedicated to the design and manufacture of products exclusively for the hotel industry, and is proud to have installed 4,000 systems in properties ranging from B&B’s to 475-room franchise hotels throughout the world. Our products, combined with our nationwide dealer support and engineering expertise, create reliable communication solutions that meet or exceed all hotel requirements. PhoneSuite is a Preferred Vendor for several major hotel chains, an Allied Member of the American Hotel & Lodging Association (AH&LA), a Founding Sponsor of the Asian American Hotel Owners Association (AAHOA), a member of Hotel Technology Next Generation (HTNG), and was recognized by the Denver Business Journal as a Top 25 Fastest-Growing Small Private Colorado Company.